Wow!!! What a long, exciting chase day. Probably the most difficult chase driving I've done though. We started in North Platte with a target of Woodward, OK, so we had a long 240 miles drive just to get into position. As we drove down, we noticed an outflow boundary left over from yesterday's mosh-pit of convection and decided to play it, getting there just as it started to light up near Englewood, KS. We were soon posed with an unusual problem: We had 3 cells nearby, and all three of them looked great both visually and on radar! We started to head north with the idea of playing the east most storm when the storm in front of us produced a funnel right in front of the vans. 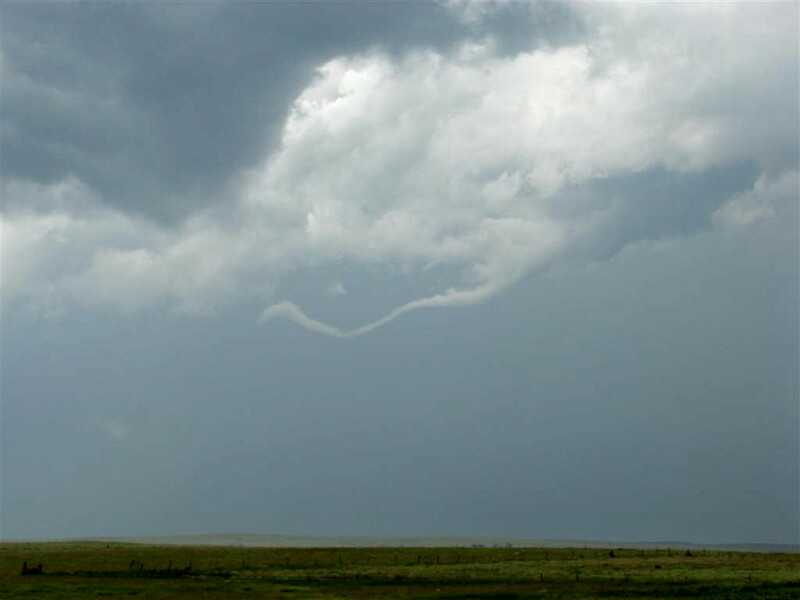 The white cigar shaped funnel didn't make it down, but the storm then produced a second long, horizontal funnel that eventually became sort of an aerial horseshoe. Everything near us was spinning like crazy all day, and this storm was no exception. We then decided to push on to Ashland and the storm to the east. On the road to Ashland, we were somewhat cut off by the core and would have to punch it. Roger ordered vans 2 and 3 to wait while he went and sampled the core. As he and Steve headed off, we started to get hit by small hail, and then we heard Roger screaming over the radio, "Big hail a mile in, turn around now!!" As this came over, we started getting hit by some bigger stuff, including maybe a few quarter sized stones. While we waited for word from Roger, the storm had developed 2 meso-markers on GRLevel3, one which was now just north of the town, and one which was rapidly approaching the town. As Stu and I decided to start inching towards the town, Roger came over the radio again: "We're east of the town, get over here right now, this thing is going to tornado any second!" With that, we went plowing into the town, which was totally flooded. As we entered the town we were getting blasted by winds from the north. Suddenly, they stopped and the winds changed and blasted us from the south as we came into town. After I saw Stu's van hit about 1 foot of water, I noticed that the business to the side of the road all had elevated driveways, so I pulled off and zipped down them to get past the flood. Then, as we popped out of the rain, Roger came over the radio again "You guys be REAL careful, the meso is coming right over the town!". Immediately as the rain cleared we could see the meso straight in front of us over the road, forcing us to come to a screeching halt. We waited for a couple of minutes and blasted east with the meso spinning like crazy and producing funnels that made it about 1/2 way to the ground. 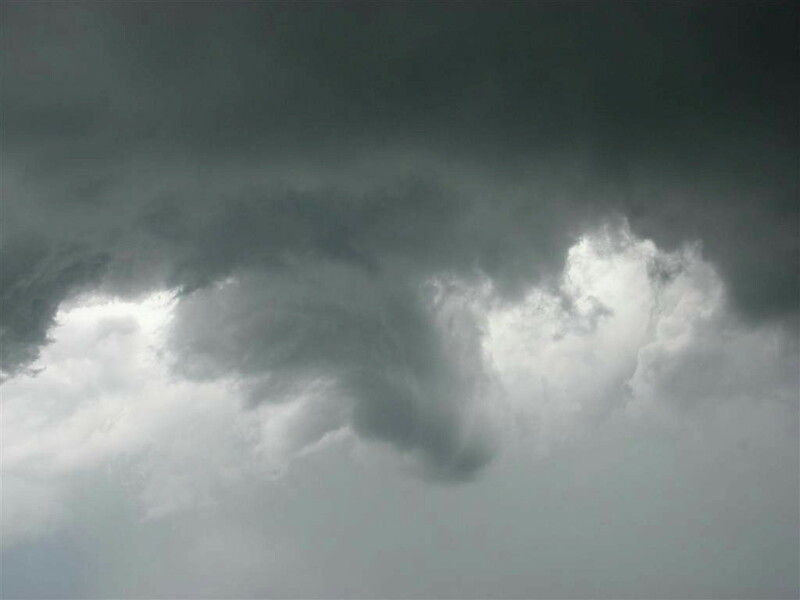 Unfortunately it did not produce for us, but the first meso had produced a truncated cone tornado for Roger! We were then posed with a tough decision between blowing north and taking the long way around the storm to get east of the enormous blob of storms now underway, or the short way through the core to the south. We chose the south option. After stopping in Buffalo, OK, we punched the core of the cell to our east, only to find we'd have to punch another core to get in front of what was now a beast of a storm near Fairview (which actually produced 2-3 tornadoes that we never got to see). The second core punch was wild: 70-80 mph winds, flooded roads, torrential rain, no visibility, and trees and debris in the road. The lightning was amazing, with repeated strikes within a mile or so of the vans, over and over again. As we passed through the remnants of the cell in Orion, it spun up an impressive meso and for the 3rd time of the day we stopped as a meso right in front of us tried to get it's act together. 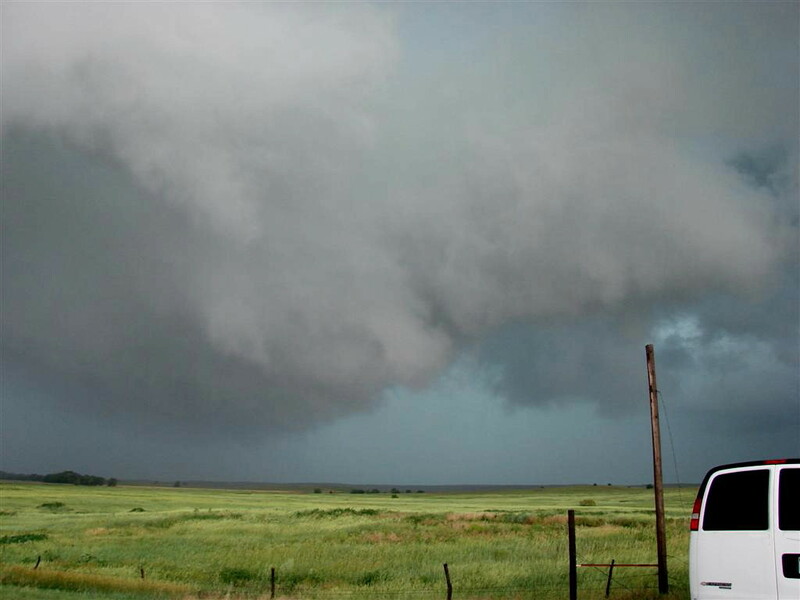 I noted wrapping rain curtains below the meso, but never did see and debris on the ground. Finally we made it into Fairview, but the storm to the north had finally given up and we decided to head south and call it a day.... we thought! As we entered O'Keene, we realized we were going to get cored by a new storm coming into town with reported ping pong ball hail and very strong straight line winds, so we decided to hole up the vans and wait in a local convenience store. 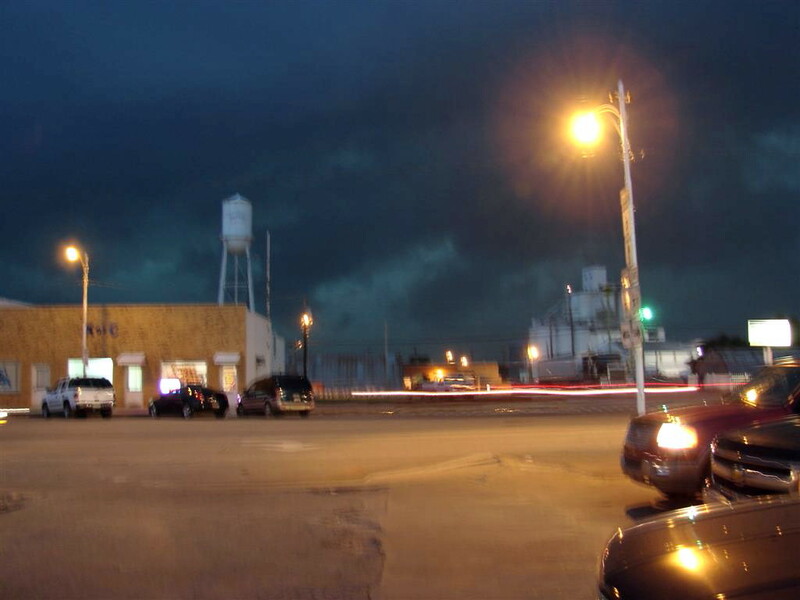 As we gathered, the tornado sirens went off (we knew there wasn't really a threat for tornadoes), and the locals started getting ready to head for the shelter of a concrete store room. There were a few tense moments but eventually we realized that the cell had missed us to the north and we decided to head south to the hotel. Unfortunately there was a monster core in our path, and after briefly considering driving through it, we started getting hailed on and were forced to run for it, finding an east bound paved road to try and escape but again we ate part of the core with blinding rain and once again an incredible amount of nearby lightning strikes, the kind where they are so close that the bolt and thunder are near simultaneous. On the several cores we punched, that was a consistent theme, very, very electrified. We finally escaped east and then headed south through Kingfisher and into El Reno. Problem: The storms were not done with us yet and we had to pass through the lines of big cores AGAIN on the way to the hotel. Same story, blinding rain, heavy wind, and crazed lightning. What a long adrenaline filled day! 3 hours of fast driving to get to the target area, then almost 8 hours of non-stop chasing! The day was a great example of how you can make a number of good decisions on chase day, but making just one that doesn't work out can cost you the big prize. We managed to make 250 miles quickly to get into chase position, and for the early part of the day, the Ashland storm was the storm of the day so to get right to that from North Platte was pretty nice. If we had a crystal ball though, we would have gone north out of Ashland then east to get around to the Fairview storm which produced 3 nice tornadoes. At the point of decision though it seemed like we could get south and east through the cores and be in position pretty easily as opposed to going 25 miles north and 25 miles east before dropping back down, which was all the road network would have allowed. The sad thing is how easy OKC chasers had the day: They probably worked their normal day, got home, looked at the radar and saw the storms, and drove 20 miles west of the city right to the anchored notch. Despite the enormous cores going up everywhere, aside from the beginning of the day there was very little hail. Lucky for us I guess, but I'm interested in going back and checking the meteorology on that one. 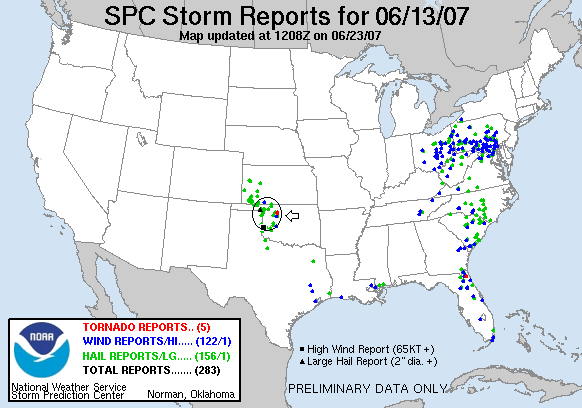 The lapse rates must not have supported big hail. Visibility continued to be a problem as it had all year. When chasing this kind of system, you quickly have so many accessory clouds around that it's hard to make out important features. 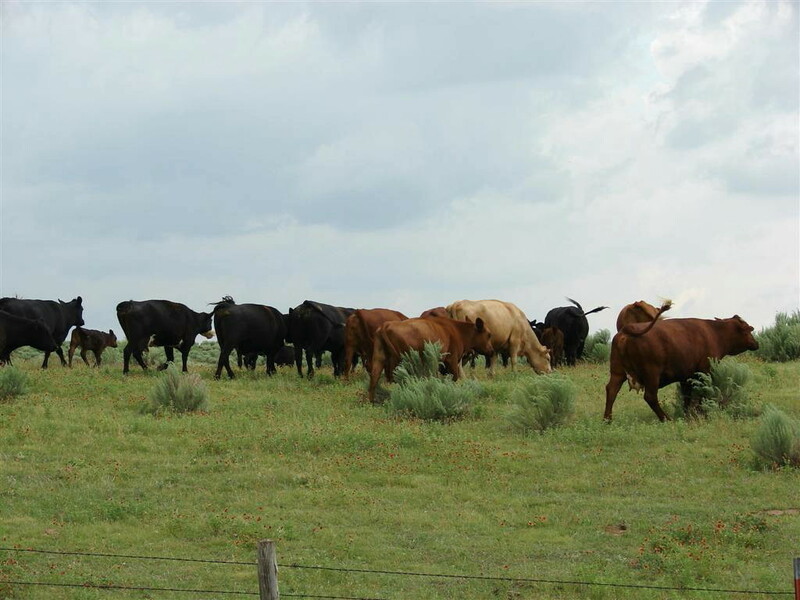 We got cows! After making it all the way down to the Kansas / Oklahoma border in record time, we had a tough decision to make as good looking storms blew up all around us along a well defined outflow boundary from the previous day's storms. The storm directly to the north dropped a cigar shaped funnel right in front of us, but the vertical rotation soon went horizontal. Everything was spinning this day! Corkscrew rotation directly above us! 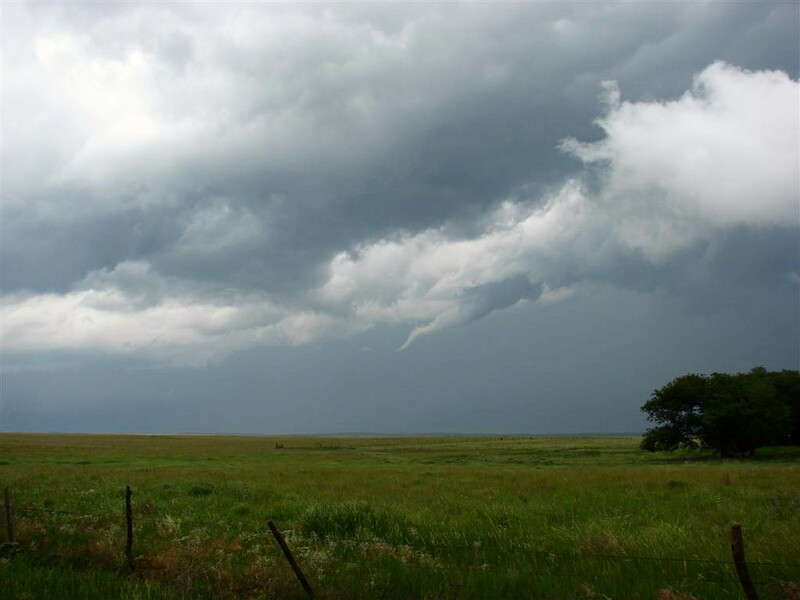 Another funnel develops, but this one is totally horizontal. 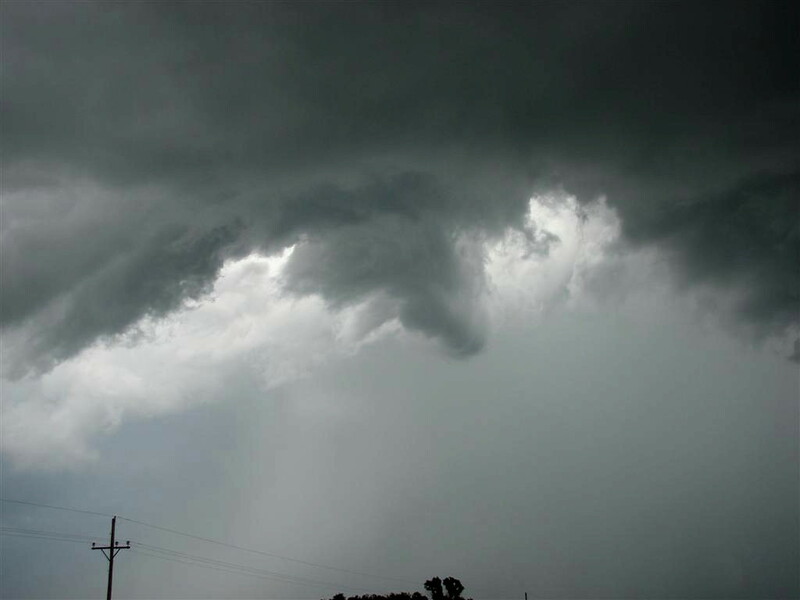 The funnel almost looped in mid-air. 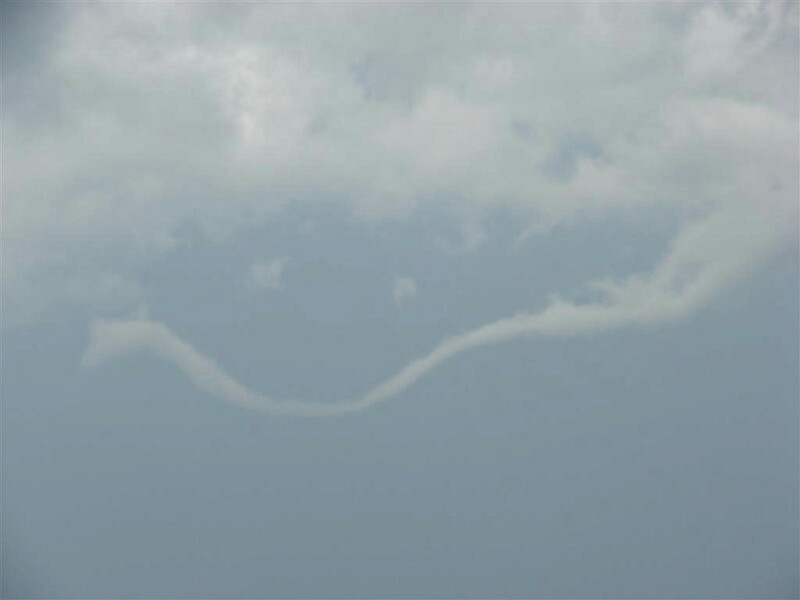 Almost a smiley face with the two puffs of cloud right above the funnel. The second meso crossed directly over us and looked like it was going to drop a tornado right in the field north of us! No dice, but here comes the rear flank downdraft. We bolt south to get out of the way. We punched core after core on this day. coming out of a core east of Orion, OK, we are met with a rapidly rotating meso and wrapping rain curtains. You really need to see the motion on the video to appreciate it. Later we gave up the chase, but the chase did not give up on us! 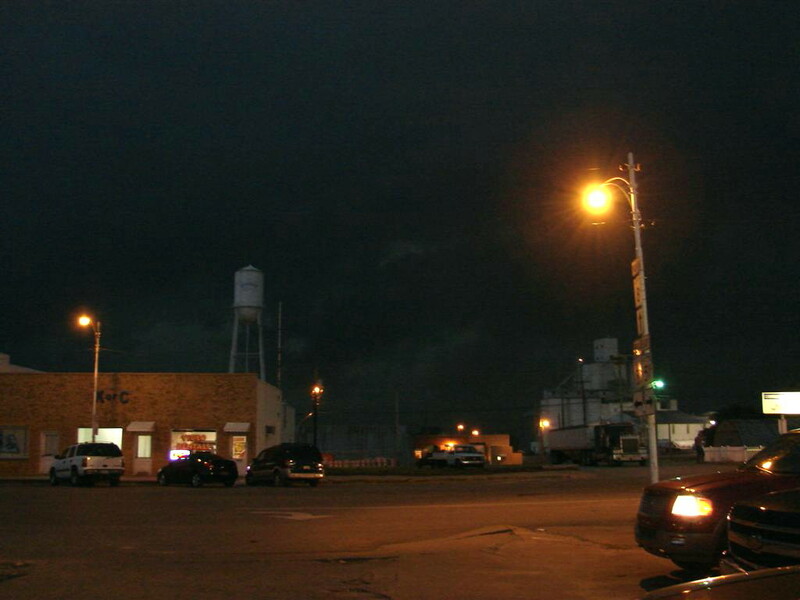 We enter O'Keene, OK minutes before a core with 80 MPH straight line winds and ping pong ball sized hail arrived. We decided to ride it out in town. Here's the approaching core.... No, it was NOT dark out yet! Here's another look with my video camera's light filter on. The vans parked to get shelter from the building. We had to move them to the back of the building when we realized the angle was wrong. 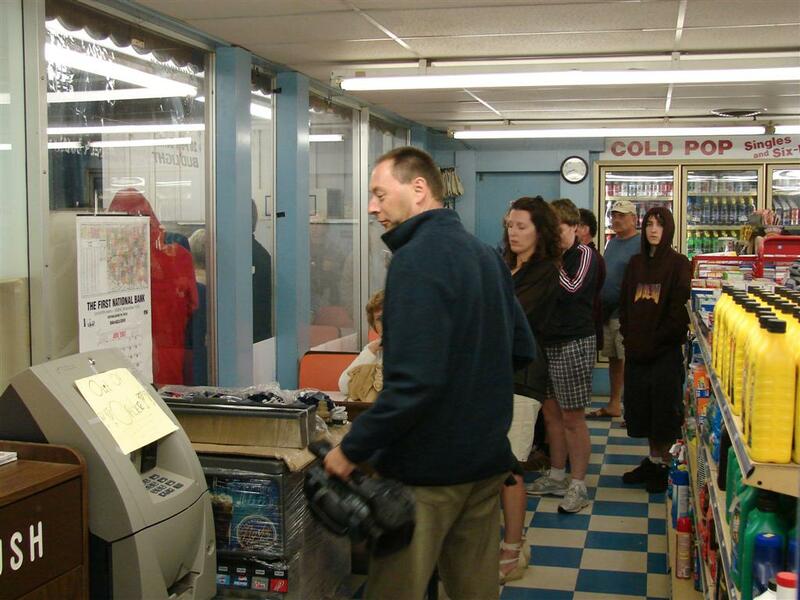 Inside the convenience store as the town's tornado sirens went off. Stu seems disappointed that the ATM machine is out of order. Even more disappointing: The core missed us to the north.